Sway BalanceTM is a mobile software system that uses the built-in motion detection of a mobile device to measure postural sway. Postural sway is an important indicator of possible balance deficits. Dysfunctional balance is one of the least effectively evaluated symptoms of neurological conditions, concussion and orthopedic injury. To administer a test, an athlete or patient is instructed to press the mobile device against their chest with both hands, while performing a five-test protocol that includes a combination of bipedal stance, tandem stance and single leg stance positions. Sway measures thoracic postural sway using the built-in motion sensors of any iOS device to estimate balance. 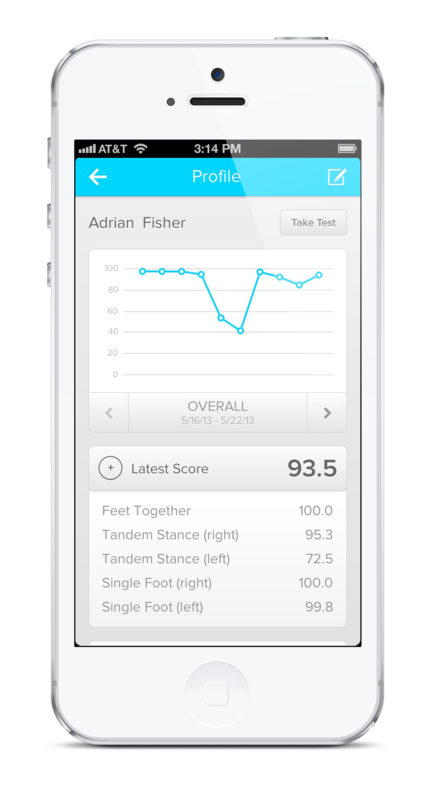 Upon completion of the test, a Sway score is displayed on the athlete’s profile based on a 100-point scale. A perfect Sway score is 100, indicating little to no movement occurred during the test trial. The establishment of an individualized baseline is important to provide the most accurate benchmark for each athlete. With the Sway Balance system, setting up a balance baseline has never been easier. Recommendations from the 3rd International Consensus Statement on Concussion(1) and the National Athletic Trainer’s Association (NATA), suggest the establishment of a neuropsychological and balance baseline for every player. Establishing an individualized baseline for each player, with the one-minute Sway test, provides an objective assessment for balance on the sideline and in recovery. The use of Sway makes return to play decisions much less about judgment and more about quantitative measures. To establish an effective baseline, athletes should be tested at least three times, with Sway scores falling within an acceptable range of variation. The Sway Balance system analyzes an athlete’s score distribution, over multiple tests, and assigns a “normal range” established using a confidence interval (α = 0.05). The confidence interval provides an individualized range, with 95% confidence that any new score will fall into the range, if the test is performed without a change in independent variables. 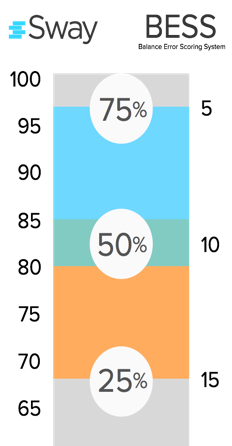 Sway uses a color-coded system to determine whether an athlete has established a consistent score with a large enough effect size. Green indicates low variation over at least three tests. Yellow shows moderate variability with at least 3 baseline tests. Red indicates either a high variability in test score or not enough tests have been completed. If an athlete shows a red confidence band, this athlete should be retested. What does my Sway Score mean? Percentile ranks provide an estimate that can be compared to the Balance Error Scoring System (BESS), the current standard of care for sideline balance assessment. Wichita State University studies have shown a strong relationship between Sway tests and the BESS through studies performed at Wichita State University (r = 0.77)(2) and Kansas University Medical Center (r = 0.87, r = 0.95)(3). Sway Medical database analyses estimates average Sway score between 80 and 85 with a recent study finding mean Sway scores to be 79.62 (+/- 18.28) with a strong correlation to BESS scores (PCC = -0.767) and no removal of outliers(2) The comparative average BESS score was 10.4 (+/-5.98), which is consistent with previous research(4) and indicates the study provided a comparable group of balancers. High correlative values between BESS and Sway shows that both tools provides accurate assessments of balance, however, the subjective nature of the BESS has been shown to produce low inter-rater reliability(5)and is less useful when comparing tests performed by different clinicians. The BESS has been shown to be a valid acute concussion assessment tool(6), however Sway Balance provides objective measures and does not rely on the clinical experience of the test administrator. The reliable change index (RCI) is calculated to better estimate whether a change in an individual’s score is the result of random variance or a change in condition. A key element of the RCI is the known reliability of the test itself. Sway Balance has shown high test-retest reliability (ICC > 0.75) and is comparable to other validated balance assessment tools such as the Biodex Balance System SD(7) and the Balance Error Scoring System(2)(3). The reliable change index is a useful tool when creating a report or further evaluating a patient to determine the likelihood that a certain score deviated from normal for that athlete. The RCI is calculated for each individual based on the standard deviation of their baseline scores compared to the individual test score that is being examined. Scores that fall outside of the confidence interval and show a RCI greater than 1.96, are marked with a red dot on the Sway Balance Web Portal reporting system. It is preferred that every athlete establish a neurocognitive and balance baseline on ImPACT and Sway, however this does not always occur. In athletes that have not established a proper baseline, the test administrator should use caution in relying on any single test. If a concussion is suspected, the athlete should be immediately removed from participation. A Sway test should be performed on the sideline if the athlete appears to show no obvious signs of concussion, and does not report symptoms. If the athlete does exhibit signs of concussion or performs poorly on the Sway Balance test (< 80 overall score), the athlete should be removed from participation until they are released to return to play by a qualified medical professional. The recommendation on what constitutes poor performance is not suitable for every athlete and athletes who are well balanced, may still score higher than 80 on the Sway Balance test even if they are impaired. THE SWAY BALANCE SOFTWARE SHOULD NOT BE THE SOLE INDICATOR FOR MAKING A RETURN TO PLAY DECISION. A COMPREHENSIVE CONCUSSION MANAGEMENT PROTOCOL INTEGRATES A MULTIFACETED APPROACH TO THE EVALUATION OF AN ATHLETE WITH A SUSPECTED CONCUSSION. 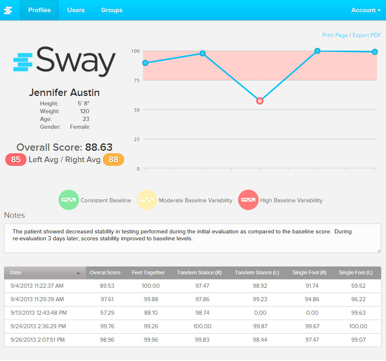 Sway can also be used to track a player in recovery from a concussion when a baseline is not available. Medical professionals should consider administering a Sway test daily to see if balance scores continue to improve or if they have plateaued. If the athlete is scoring consistently, it can be an indication that balance has stabilized or returned to normal. With any test, there is a brief period of familiarization, so it is important to take three to four tests before using the Sway Balance system to assist in any clinical judgment. (1) Cantu, Robert C. “Consensus Statement on Concussion in Sport.” The Third International Conference on Concussion, Zurich, November ￼2008.”Neurosurgery 64.5 (2009): 786-787. (2) Amick, Patterson, J.A., R.Z., Hankensen, N., and Jorgensen, M.J. (2013) Comparison of the SWAY Balance Mobile Application to a Commonly used Balance Assessment Method. International Journal of Athletic Therapy & Training. Under Review. (3)Burghart, M., J. Taylor and J. Radel (2013) Sideline Screening for Balance and Neurocognition – There’s an app for that… Sports Neuropsychology Society annual meeting, Minneapolis, MN (May 2013). (4)Iverson, G.L., Kaarto, M.L., and Koehle, M.S. (2008) Normative data for the balance error scoring system: Implications for brain injury evaluations. Brain Injury; 22(2): 147-152. (5)Finnoff, J.T., Peterson, V.J., Hollman, J.H., and Smith, I. (2009) Intrarater and interrater reliability of the Balance Error Scoring System (BESS). American Academy of Physical Medicine and Rehabilitation; 1(1): 50–54. (6)Guskiewicz, Kevin M., Scott E. Ross, and Stephen W. Marshall. “Postural stability and neuropsychological deficits after concussion in collegiate athletes.” Journal of Athletic Training 36.3 (2001): 263.